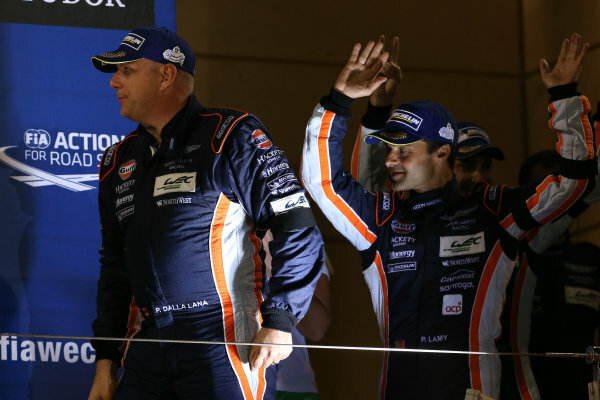 2015 FIA World Endurance Championship,<br /> Bahrain International Circuit, Bahrain.<br /> 19th - 21st November 2015.<br /> Paul Dalla Lana / Pedro Lamy / Mathias Lauda Aston Martin Racing Aston Martin Vantage V8.<br /> World Copyright: Jakob Ebrey / LAT Photographic. 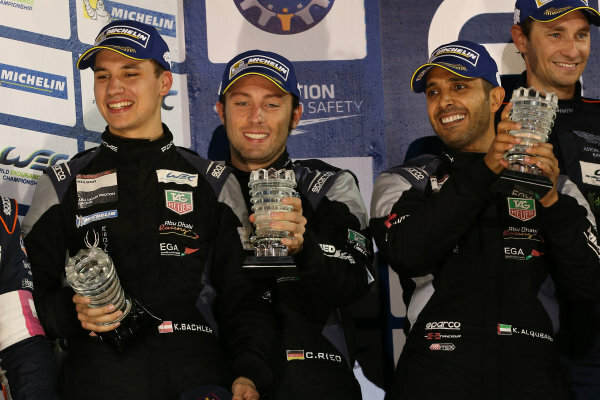 2015 FIA World Endurance Championship,<br /> Bahrain International Circuit, Bahrain.<br /> 19th - 21st November 2015.<br /> GT Am Podium (l-r) Marco Mapelli / Khaled Al Qubaisi / Klaus Bachler Abu Dhabi Proton Racing Porsche 911 RSR, Paul Dalla Lana / Pedro Lamy / Mathias Lauda Aston Martin Racing Aston Martin Vantage V8, Christian Ried / Patrick Long / Marco Seefried Dempsey Racing Proton Porsche 911 RSR.<br /> World Copyright: Jakob Ebrey / LAT Photographic. 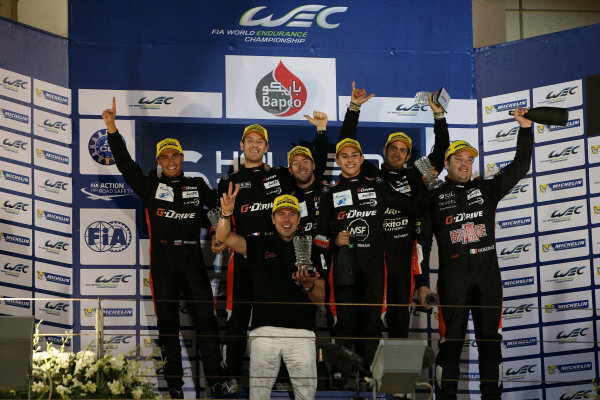 2015 FIA World Endurance Championship,<br /> Bahrain International Circuit, Bahrain.<br /> 19th - 21st November 2015.<br /> Marco Mapelli / Khaled Al Qubaisi / Klaus Bachler Abu Dhabi Proton Racing Porsche 911 RSR.<br /> World Copyright: Jakob Ebrey / LAT Photographic. 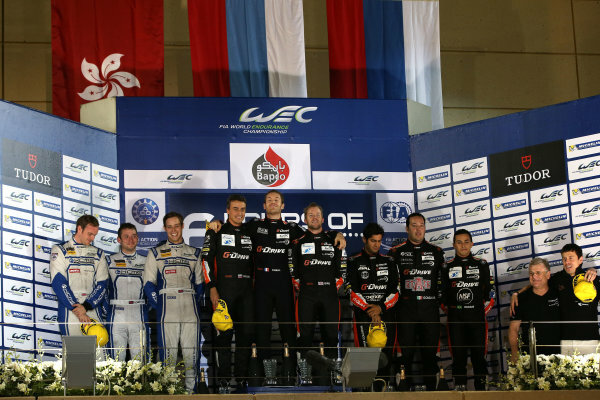 2015 FIA World Endurance Championship,<br /> Bahrain International Circuit, Bahrain.<br /> 19th - 21st November 2015.<br /> Romain Rusinov / Julien Canal / Sam Bird G-Drive Racing Ligier JS P2 Nissan and Gustavo Yacaman / Luis Felipe Derani / Ricardo Gonzalez G-Drive Racing Ligier JS P2 Nissan celeberate winning the P2 championship.<br /> World Copyright: Jakob Ebrey / LAT Photographic. 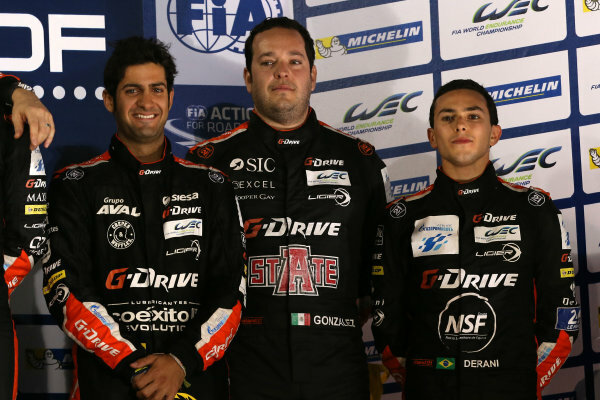 2015 FIA World Endurance Championship,<br /> Bahrain International Circuit, Bahrain.<br /> 19th - 21st November 2015.<br /> Romain Rusinov / Julien Canal / Sam Bird G-Drive Racing Ligier JS P2 Nissan and Gustavo Yacaman / Luis Felipe Derani / Ricardo Gonzalez G-Drive Racing Ligier JS P2 Nissan.<br /> World Copyright: Jakob Ebrey / LAT Photographic. 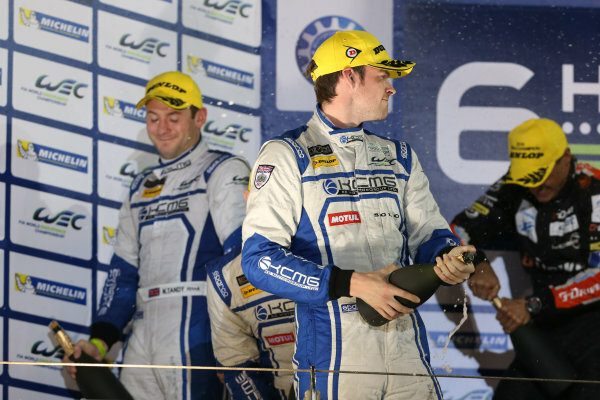 2015 FIA World Endurance Championship,<br /> Bahrain International Circuit, Bahrain.<br /> 19th - 21st November 2015.<br /> Romain Rusinov G-Drive Racing Ligier JS P2 Nissan.<br /> World Copyright: Jakob Ebrey / LAT Photographic. 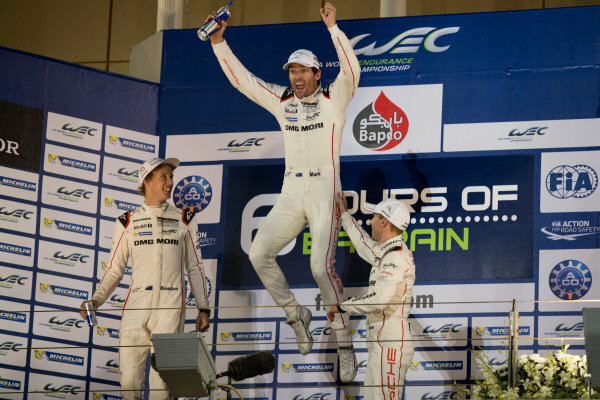 2015 FIA World Endurance Championship,<br /> Bahrain International Circuit, Bahrain.<br /> 19th - 21st November 2015.<br /> Matthew Howson / Richard Bradley / Nick Tandy KCMG Oreca 05 Nissan<br /> World Copyright: Jakob Ebrey / LAT Photographic. 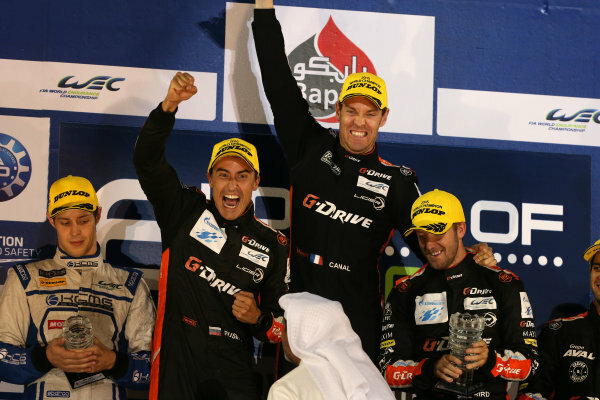 2015 FIA World Endurance Championship,<br /> Bahrain International Circuit, Bahrain.<br /> 19th - 21st November 2015.<br /> Romain Rusinov / Julien Canal / Sam Bird G-Drive Racing Ligier JS P2 Nissan.<br /> World Copyright: Jakob Ebrey / LAT Photographic. 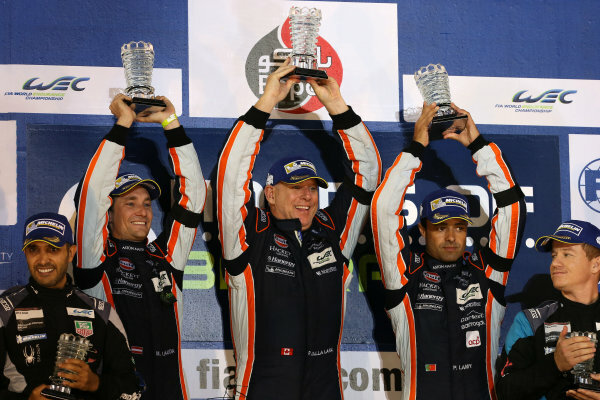 2015 FIA World Endurance Championship,<br /> Bahrain International Circuit, Bahrain.<br /> 19th - 21st November 2015.<br /> Gustavo Yacaman / Luis Felipe Derani / Ricardo Gonzalez G-Drive Racing Ligier JS P2 Nissan.<br /> World Copyright: Jakob Ebrey / LAT Photographic. 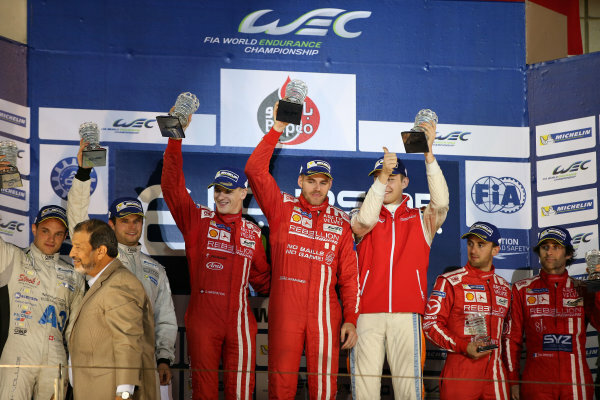 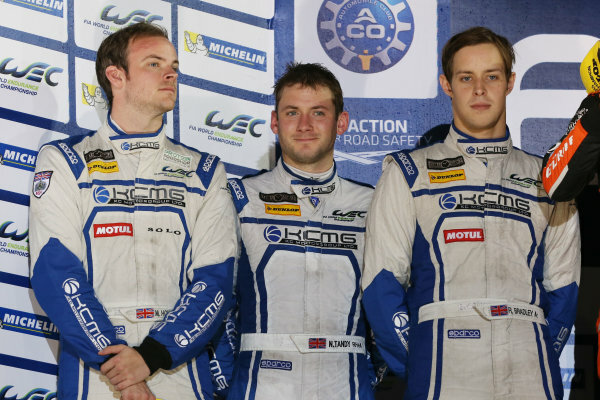 2015 FIA World Endurance Championship,<br /> Bahrain International Circuit, Bahrain.<br /> 19th - 21st November 2015.<br /> P2 Podium (l-r) Matthew Howson / Richard Bradley / Nick Tandy KCMG Oreca 05 Nissan, Romain Rusinov / Julien Canal / Sam Bird G-Drive Racing Ligier JS P2 Nissan, Gustavo Yacaman / Luis Felipe Derani / Ricardo Gonzalez G-Drive Racing Ligier JS P2 Nissan.<br /> World Copyright: Jakob Ebrey / LAT Photographic. 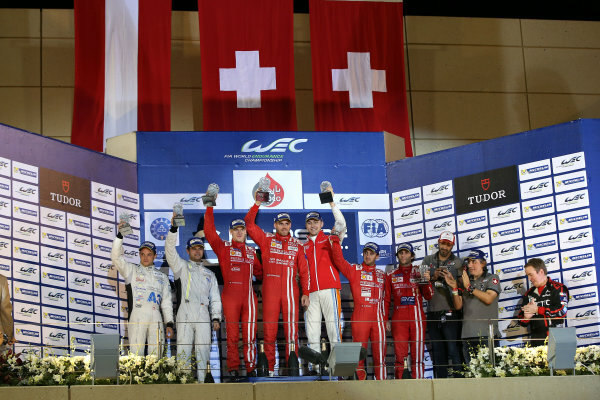 2015 FIA World Endurance Championship,<br /> Bahrain International Circuit, Bahrain.<br /> 19th - 21st November 2015.<br /> xxxx<br /> World Copyright: Jakob Ebrey / LAT Photographic. 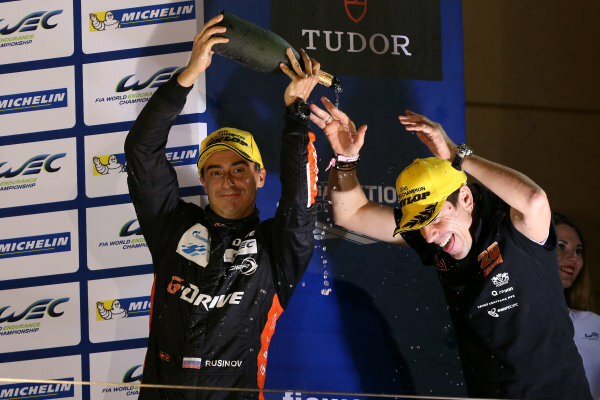 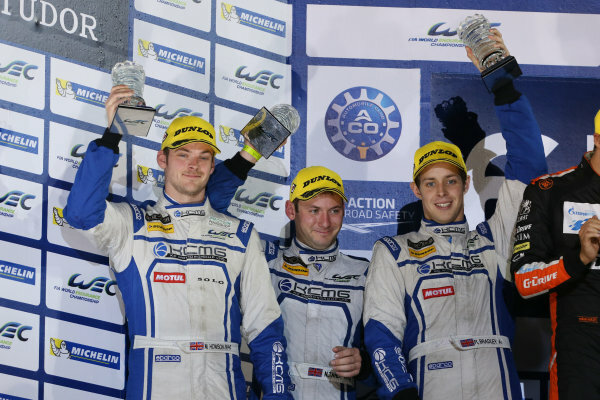 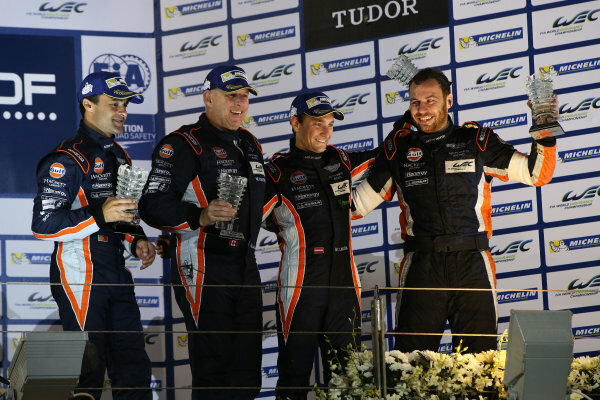 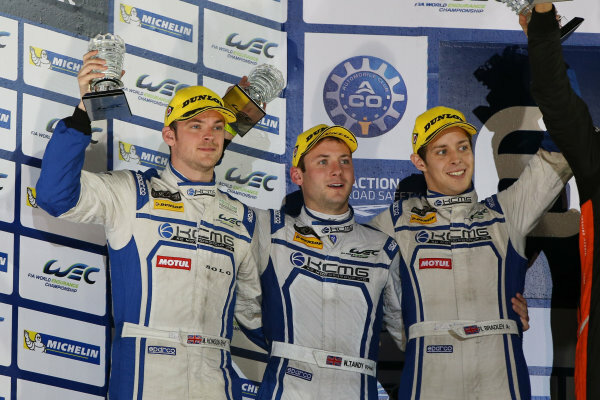 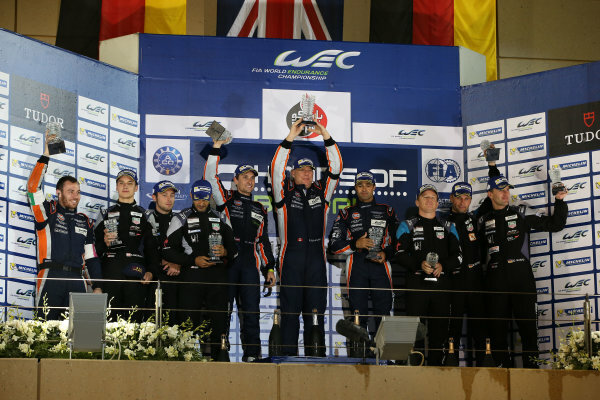 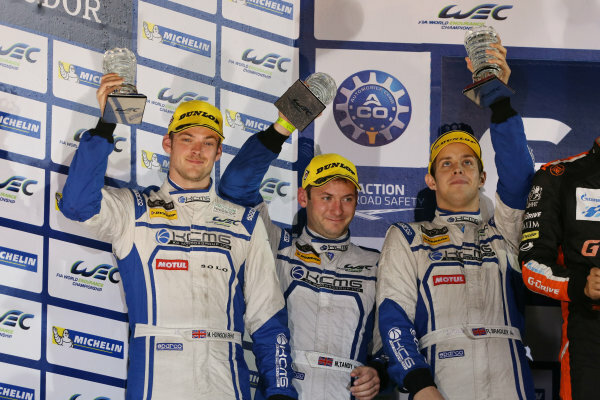 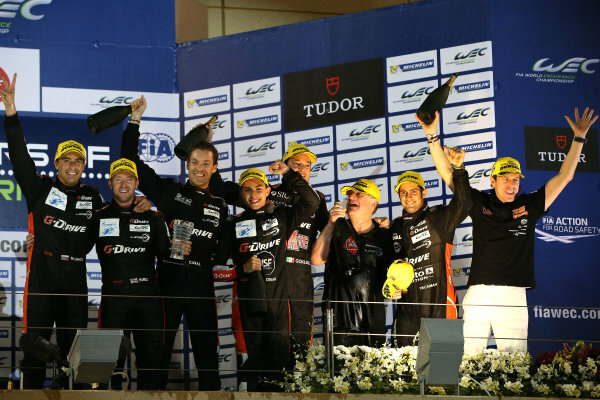 2015 FIA World Endurance Championship,<br /> Bahrain International Circuit, Bahrain.<br /> 19th - 21st November 2015.<br /> P1 Podium (l-r) Simon Trummer / Pierre Kaffer Team Bykolles CLM P1/01 AER, Alexandre Imperatori / Dominik Krahaimer / Matheo Tuscher Rebellion Racing Rebellion R1 AER, Nicolas Prost / Mathias Beche Rebellion Racing Rebellion R1 AER.<br /> World Copyright: Jakob Ebrey / LAT Photographic. 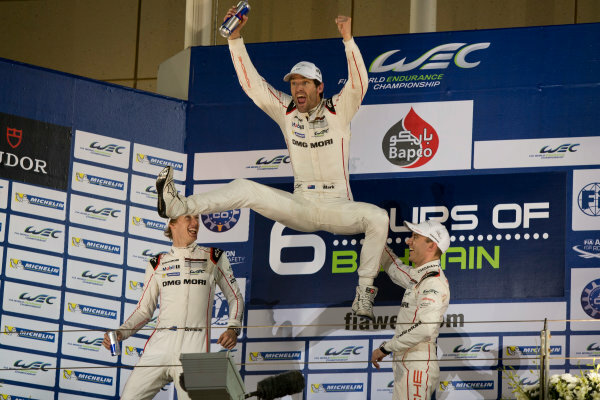 2015 FIA World Endurance Championship,<br /> Bahrain International Circuit, Bahrain.<br /> 19th - 21st November 2015.<br /> Timo Bernhard / Mark Webber / Brendon Hartley Porsche Team Porsche 919 Hybrid.<br /> World Copyright: Jakob Ebrey / LAT Photographic.